sport /spôrt/, n. an activity involving physical exertion and skill in which an individual or team competes against another or others for entertainment. magic /ˈmajik/, n. the power of apparently influencing the course of events by using mysterious or supernatural forces. Here, words are boiled to their essence. 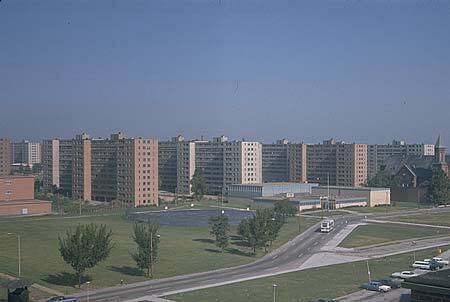 But that essence is dry, functional, almost bureaucratically sapped of color or pop, like high modernist architecture. Which trains you to think of the dictionary as a utility, not a quarry of good things, not a place you’d go to explore and savor. Worse, the words themselves take on the character of their definitions: they are likewise reduced. A delightful word like “fustian” — delightful because of what it means, because of the way it looks and sounds, because it is unusual in regular speech but not so effete as to be unusable, is described, efficiently, as “pompous or pretentious speech or writing.” Not only is this definition (as we’ll see in a minute) simplistic and basically wrong, it’s just not in the same class, English-wise, as “fustian.” The language is tin-eared and uninspired. It’s criminal: This is the place where all the words live and the writing’s no good. The New Oxford American dictionary, by the way, is not like singularly bad. Google’s dictionary, the modern Merriam-Webster, the dictionary at dictionary.com: they’re all like this. They’re all a chore to read. There’s no play, no delight in the language. The definitions are these desiccated little husks of technocratic meaningese, as if a word were no more than its coordinates in semantic space. John McPhee — one the great American writers of nonfiction, almost peerless as a prose stylist — once wrote an essay for the New Yorker about his process called “Draft #4.” He explains that for him, draft #4 is the draft after the painstaking labor of creation is done, when all that’s left is to punch up the language, to replace shopworn words and phrases with stuff that sings. The way you do it, he says, is “you draw a box not only around any word that does not seem quite right but also around words that fulfill their assignment but seem to present an opportunity.” You go looking for le mot juste. Suppose you sense an opportunity beyond the word “intention.” You read the dictionary’s thesaurian list of synonyms: “intention, intent, purpose, design, aim, end, object, objective, goal.” But the dictionary doesn’t let it go at that. It goes on to tell you the differences all the way down the line — how each listed word differs from all the others. Some dictionaries keep themselves trim by just listing synonyms and not going on to make distinctions. You want the first kind, in which you are not just getting a list of words; you are being told the differences in their hues, as if you were looking at the stripes in an awning, each of a subtly different green. I do not have this first kind of dictionary. In fact I would have never thought to use a dictionary the way McPhee uses his, and the simple reason is that I’ve never had a dictionary worth using that way. If you were to look up the word “intention” in my dictionary here’s all you would see: “a thing intended; an aim or plan.” No, I don’t think I’ll be punching up my prose with that. I grew up in canoes on northern lakes. Thirty years later, I was trying to choose a word or words that would explain why anyone in a modern nation would choose to go a long distance by canoe. I was damned if I was going to call it a sport, but nothing else occurred. His professed criteria were to take it easy, see some wildlife, and travel light with his bark canoes — nothing more — and one could not help but lean his way… Travel by canoe is not a necessity, and will nevermore be the most efficient way to get from one region to another, or even from one lake to another — anywhere. A canoe trip has become simply a rite of oneness with certain terrain, a diversion of the field, an act performed not because it is necessary but because there is value in the act itself. Unfortunately, he never comes out and says exactly which dictionary he’s getting all this juice out of. But I was desperate to find it. What was this secret book, this dictionary so rich and alive that one of my favorite writers was using it to make heroic improvements to his writing? And that turned out to be enough to find it. Noah Webster is not the best-known of the Founding Fathers but he has been called “the father of American scholarship and education.” There’s actually this great history of how he almost singlehandedly invented the very idea of American English, defining the native tongue of the new republic, “rescuing” it from “the clamour of pedantry” imposed by the Brits. He developed a book, the Blue Backed Speller, which was meant to be something of a complete linguistic education for young American kids, teaching them in easy increments how to read, spell, and pronounce words, and bringing them up on a balanced diet of great writing. It succeeded. It was actually the most popular book of its time; by 1890 it had sold 60 million copies. But that wasn’t even Webster’s most ambitious project. Certainly it’s not what he became known for. In 1807, he started writing a dictionary, which he called, boldly, An American Dictionary of the English Language. He wanted it to be comprehensive, authoritative. Think of that: a man sits down, aiming to capture his language whole. Dictionaries today are not written this way. In fact it’d be strange even to say that they’re written. They are built by a large team, less a work of art than of engineering. When you read an entry you don’t get the sense that a person labored at his desk, alone, trying to put the essence of that word into words. That is, you don’t get a sense, the way you do from a good novel, that there was another mind as alive as yours on the other side of the page. It makes sense: there was, and is, something remarkable about his 1828 dictionary, and the editions that followed in its line (the New and Revised 1847, the Unabridged 1864, the International 1890 and 1900, the New International 1909, the 1913, etc.). You can see why it became cliché to start a speech with “Webster’s defines X as…”: with his dictionary the definition that followed was actually likely to lend gravitas to your remarks, to sound so good, in fact, that it’d beat anything you could come up with on your own. Take a simple word, like “flash.” In all the dictionaries I’ve ever known, I would have never looked up that word. I’d’ve had no reason to — I already knew what it meant. 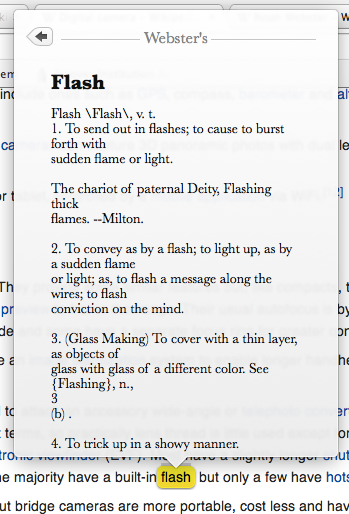 But go look up “flash” in Webster’s (the edition I’m using is the 1913). The first thing you’ll notice is that the example sentences don’t sound like they came out of a DMV training manual (“the lights started flashing”) — they come from Milton and Shakespeare and Tennyson (“A thought flashed through me, which I clothed in act”). You’ll find a sense of the word that is somehow more evocative than any you’ve seen. “2. To convey as by a flash… as, to flash a message along the wires; to flash conviction on the mind.” In the juxtaposition of those two examples — a message transmitted by wires; a feeling that comes suddenly to mind — is a beautiful analogy, worth dwelling on, and savoring. Listen to that phrase: “to flash conviction on the mind.” This is in a dictionary, for God’s sake. … Flashing differs from exploding or disploding in not being accompanied with a loud report. To glisten, or glister, is to shine with a soft and fitful luster, as eyes suffused with tears, or flowers wet with dew. It’s as if someone decided that dictionaries these days had to sound like they were written by a Xerox machine, not a person, certainly not a person with a poet’s ear, a man capable of high and mighty English, who set out to write the secular American equivalent of the King James Bible and pulled it off. I don’t want you to conclude that it’s just a matter of aesthetics. Yes, Webster’s definitions are prettier. But they are also better. In fact they’re so much better that to use another dictionary is to keep yourself forever at arm’s length from the actual language. Recall that the New Oxford, for the word “fustian,” gives “pompous or pretentious speech or writing.” I said earlier that that wasn’t even really correct. Here, then, is Webster’s definition: “An inflated style of writing; a kind of writing in which high-sounding words are used, above the dignity of the thoughts or subject; bombast.” Do you see the difference? What makes fustian fustian is not just that the language is pompous — it’s that this pomposity is above the dignity of the thoughts or subject. It’s using fancy language where fancy language isn’t called for. It’s a subtle difference, but that’s the whole point: English is an awfully subtle instrument. A dictionary that ignores these little shades is dangerous; in fact in those cases it’s worse than useless. It’s misleading, deflating. It divests those words of their worth and purpose. Take “pathos.” This is one of those words I used to keep looking up because I kept forgetting what it meant — and every time I’d go to the dictionary I would get this terse, limiting definition: “a quality that evokes pity or sadness.” Not much there to grab a hold of. I’d wonder, Is that really all there is to pathos? It had always seemed a grander word than that. But this was the dictionary, and whatever it declared was final. pathos /ˈpāˌTHäs/, n. 1. The quality or character of those emotions, traits, or experiences which are personal, and therefore restricted and evanescent; transitory and idiosyncratic dispositions or feelings as distinguished from those which are universal and deep-seated in character; — opposed to ethos. It continued. 2. That quality or property of anything which touches the feelings or excites emotions and passions, esp., that which awakens tender emotions, such as pity, sorrow, and the like; contagious warmth of feeling, action, or expression; pathetic quality; as, the pathos of a picture, of a poem, or of a cry. Dear god! How did I not know about this dictionary? How could you even call yourself a dictionary if all you give for “pathos” is “a quality that evokes pity or sadness”? Webster’s definition is so much fuller, so much closer to felt experience. Notice, too, how much less certain the Webster definition seems about itself, even though it’s more complete — as if to remind you that the word came first, that the word isn’t defined by its definition here, in this humble dictionary, that definitions grasp, tentatively, at words, but that what words really are is this haze and halo of associations and evocations, a little networked cloud of uses and contexts. What I mean is that with its blunt authority the New Oxford definition of “pathos” — “a quality that evokes pity or sadness” — shuts down the conversation, it shuts down your thinking about the word, while the Webster’s version gets your wheels turning: it seems so much more provisional — “that which awakens tender emotions, such as pity, sorrow, and the like; contagious warmth of feeling, action, or expression; pathetic quality; as, the pathos of a picture, of a poem, or of a cry” — and therefore alive. Most important, it describes a word worth using: a mere six letters that have come to stand for something huge, for a complex meta-emotion with mythic roots. Such is the power of actual English. The closest thing you can get to a plain-text, easily hackable, free, out-of-copyright version of the dictionary McPhee probably used is Webster’s Revised Unabridged Dictionary (1913 + 1828). Download this archive from S3. Unzip it and launch the DictUnifier app. Drag the stardict-dictd-web1913-2.4.2.tar.bz2 file, still compressed, onto that app’s little drag-and-drop area. It might take a few seconds before the conversion process starts. Once it does, it’ll take about 30 minutes to finish. If you want to always see Webster’s results by default, go to the Dictionary app’s preferences and drag Webster’s to the top of the list. 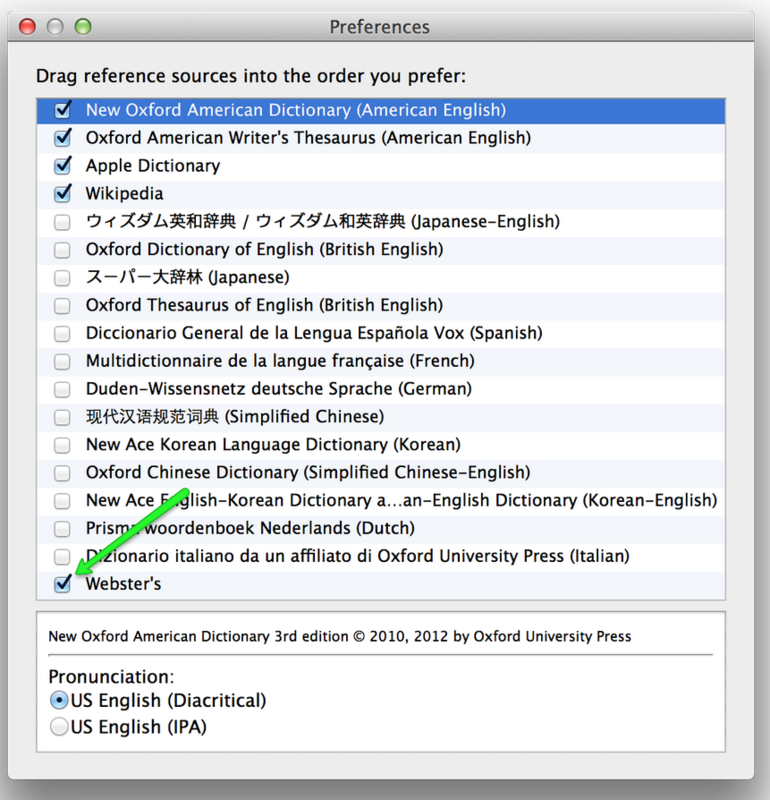 If you’re on OS X Lion, follow these instructions so that Dictionary results appear first in Spotlight searches. For Android, you can follow these instructions, courtesy of @TheRealPlato. To add the dictionary as a search engine on Chrome, follow these instructions, courtesy of @chancelionheart. And finally, follow these instructions to get the dictionary on your Kindle.